Conducting UnderSCORE: An Australian Video Game Symphony with The Crescendo Orchestra, 2018. Crescendo Showcase, 2015. Held in Tamworth, NSW, AU. YouTube Series Four with The Crescendo Orchestra, 2019. UnderSCORE: An Australian Video Game Symphony with The Crescendo Orchestra, 2018. Jasen Scott is a conductor, pianist and vocalist raised in the cowboy boots country of Tamworth, NSW, AU, with a diverse portfolio as a musician, conductor, vocal coach, entrepreneur, musical director and arranger/orchestrator. Always with a slice of cheesy humour, Jasen explores the music of the popular market in the context of the orchestral genre. Working as an ensemble and solo musician with organisations such as the NSW Department of Education, and touring professional and amateur theatre groups, Jasen has established a strong CV for the age of 23. As a graduate of the Melbourne Conservatorium of Music (B. Mus, Performance), Jasen commenced the Honours Degree in Bachelor of Music in Conducting, one of only three successful candidates, working with the Adelaide Symphony Orchestra and the University of Adelaide, in 2019. In his honours degree, Jasen is studying orchestral conducting under Dr Luke Dollman. Jasen has studied classical piano and accompaniment with Australian concert pianist, Stephen McIntyre, OAM. He studied classical and jazz piano with Dr. Jane Hammond (Monash University) for four years. Jasen is the Artistic & Managing Director of Crescendo Music Australia - his own creation - for which he manages, arranges music for and directs the Crescendo Orchestra. He directed the orchestra's previous three YouTube series', and will direct the orchestra's fourth season later this year. He musically directed UnderSCORE: An Australian Video Game Symphony, a concert funded by Creative Victoria that featured the music of seven Australian video games. In addition to conducting, Jasen has overseen the organisation's operations & management since its conception in 2016, working with over 100 different musicians and artists and a portfolio of clients in its relatively new life. Past projects have included regional and interstate tours, recording projects with commercial artists, arrangement contracts and orchestral contracting for live & recorded performance. 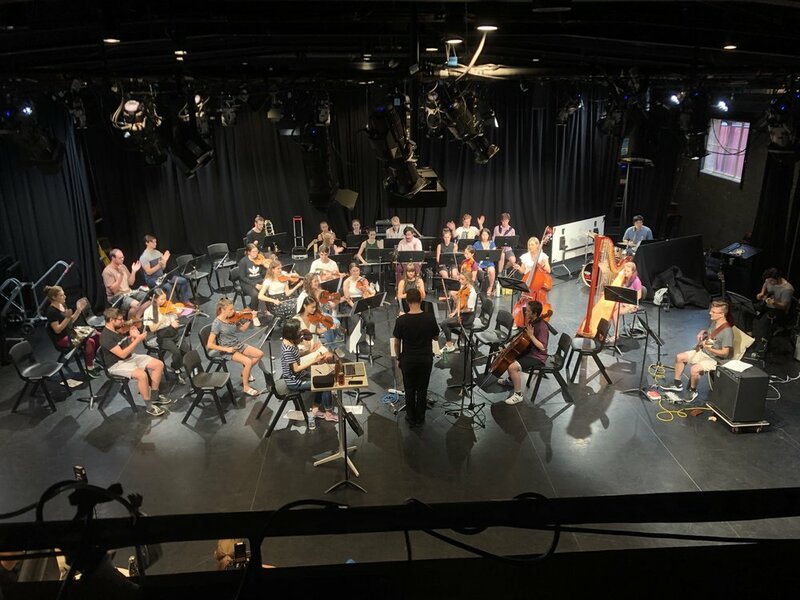 Arranging and orchestration is one of Jasen's core competencies, with his most notable work including professional arrangements for the NSW Department of Education. His orchestrations and arrangements are regularly performed and recorded by The Crescendo Orchestra. Other clients have included the City of Port Philip Council, and the Epiphanies Showcase (2017). His portfolio is not limited to piano and conducting however - he is also a respected Clarinet player, playing with orchestras such as the Australian Youth Orchestra, the University of Melbourne Wind Orchestra, the NSW State Senior Wind Orchestra performing at the Sydney Opera House, and the NSW West of the Divide Concert Band. Prior to his work as a musician, Jasen worked through the corporate management ranks at McDonald's Australia, learning key skills as a business and operational manager through the organisation's RTO program, eventually earning him a Certificate III in Retail Operations and a Certificate IV in Frontline Management. Since commencing study at the University of Melbourne, Jasen has further developed these management skills in the Faculty of Business, Economics & Management through various management subjects - consistently achieving First Class Honours in this area. Throughout his younger life, Jasen grew up in the environment of technical aspects of performance. Alongside the guidance of respected technical director & sound engineer Peter Scott (his father), Jasen has a highly competent skill level in technical aspects of performance and recording. In 2015, he was awarded a Certificate III in Live Production, Theatre & Events (Technical Operations), and has extensive knowledge of the operation of audio, lighting, visual and staging elements. Jasen is a recipient of the Order of Australia for Service to the Community in 2012, and is regular recipient of recognition for his ongoing community service work. These awards are a testament to the hands-on experience that Jasen has in managing projects of all shapes and sizes... and furthermore, his generosity to support a good cause. In his "spare time", Jasen enjoys a nice evening of cooking while watching #HYBPA or Ramsay’s Hotel Hell and curling up on the couch under the air con with a glass of wine. Apparently musicians relax.. sometimes.